Author neozeedPosted on January 30, 2013 September 14, 2017 Categories random updatesLeave a comment on Lotus 1-2-3 Musical! MIDI (Musical Instrument Digital Interface) turns 30 today. I remember actively listening to midi file versions of songs I liked in the days before Napster but apparently I never really appreciated the technology for what it was. I remember the first time I saw a MIDI deck, was back in high-school (whoa step into the time machine) when this kid, Adam, was showing off the latest in awesomeness, Wing Commander! Which was an awesome spectacle on a VGA equipped 386 DX along with a brand new MIDI deck. Prior to then, the only PC’s I’d seen had glorious CGA graphics, and utilized the PC speaker as a glorified beeper. At that point I’d given up on buying an Amiga as my parents didn’t like the idea of me spending $599 on an Amiga 500, but PC’s you could buy in pieces and of course under the radar of obsessive parents. But going back to MIDI, for a while in the late 80’s and early 90’s MIDI files were traded like crazy much like MP3’s in the 2000’s. 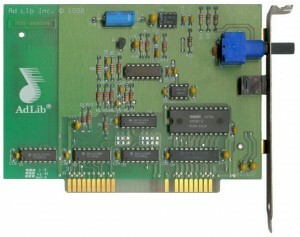 And the one card that started to bring MIDI sound to the masses was the good old Adlib! The Adlib was a simple enough looking card which integrated the Yamaha YM3812 to a PC. It wasn’t capable of wave synthesis, instead it could play simple instruments. But hey it was a massive upgrade from simple beeps & chirps of the IBM PC Speaker. That was until I finally assembled my 286 PC, and then found the game Mean Streets, the first in the Tex Murphy series. What made this game special was that it used its “real sound” technology to quickly pulse the pc speaker so it could play basic wav files. It was an amazing thing to witness at the time, when a 286 with CGA graphics could make some basic sounds, and play a quick bit of into music! Even better, is that there were Amiga MOD players that could output via the PC speaker, and even with the release of Windows 3.1 there was a pc speaker wav driver. But back to MIDI, for me anyways the best player was the midi player bundled with Windows 3.1 as at least you could kind of multitask, and listen to something while doing something else. It really is funny to imagine a time before CD-ROMs being common place, and needing some kind of massive super computer to playback a MP3 in realtime! Then again back then odds are if you were using a computer and wanted to listen to music you either would turn on the radio, or break out a tape deck! Author neozeedPosted on January 29, 2013 Categories random updates3 Comments on So I just noticed that MIDI is 30 years old! You can now easily download the scriptable Amiga emulator, and even better inject your own ADF’s and whatnot. Naturally you’ll want the AROS ROM’s one & two. You can even download my ADF. This is a bootable diskette with the version of Dungeon I built using DICE. 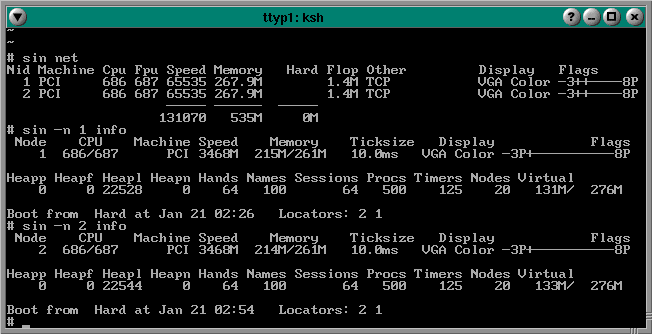 So while I was on the path of running some ancient Linux on the UAE Amiga 3000 emulator but without any real luck. So for the heck of it I figured I’d give NetBSD a whirl. Much like Linux, the first platform other than the i386 to get some mainstream love. While 4.4 BSD had been adding support for the m68k via the HP 9000-300 series based workstations, the Amiga was something that was sold retail, and could be put in the hands of hackers, rather than lab rats.. So maybe I’ll try to bring it back to life some time now that I can at least run NetBSD 1.0 .. Or maybe I’m getting ahead of myself.  Where the ‘other’ is of course the /usr partition. Then with that in hand it is a simple matter of loading the boot loader from within AmigaDOS. 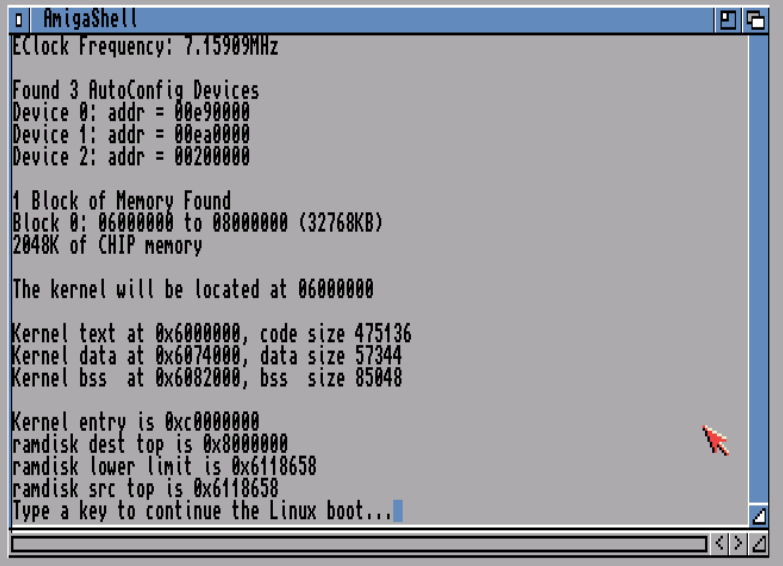 The one weird thing I found is that while this part goes all fine, later on under NetBSD you can only mount AmigaDOS partitions read only, so how do you get a new kernel back onto the Amiga side? I suppose a working network, and a 2nd machine.. Which would make sure, and of course NetBSD was built with the idea that everyone was collaborating over the internet so people would have net access. It may not seem too obvious but back here the ‘a’ partition is the root, ‘d’ is the AmigaDOS operating system partition while ‘e’ is the work partition where our install was saved. From there it really is NetBSD and it just acts like any other NetBSD. So of course I could prattle endlessly about this, how historic it is that NetBSD on the Amiga shows that the older hp300 port could not only be adapted to new platforms, but even eventually extended to support the 68040 processor which had a different and incompatible MMU. For those of you are are impatient, you too can run NetBSD 1.0! You can find a pre-installed image here. And just use the prior exe & config from the WinUAE beta that included MMU support. Just alter the config so that it picks up the NetBSD disk. I thought it was cool, but a French Amiga fan site, linked me and sent a bunch of traffic, amigaimpact.org. Now I know what you are saying, I can’t read French! .. Well it is 2013, and google translate doesn’t do such a bad job of mangling les Francais.. Author neozeedPosted on January 21, 2013 January 21, 2013 Categories Amiga2 Comments on le Retour des AMIX de l’impact Amiga..
ATARI US files for Chapter-11. Atari Consumer Electronics Division, the Jaguar & ST people pretty much died off in 1996, while the arcade people prospered on.. Or so it would seem. The company has a valuation of just 25.4 MM Euros… But is it enough for 2600 legacy game lore? I don’t think missle command nostalga is really worth that much. The last big hit of theirs, was publishing rollercoaster tycoon.. Even looking through the highstreet today, anything Atari was in the bargin bin, the problem being that 30 year old games just don’t hold anyone’s interest for more than a few minutes today.. Their catalog is just.. old. Oh well, it is chapter 11, which means ATARI gets time to pay creditors, take on new debt, and do a reorganization. They may pull through this, although the world is a much different place than 1972, only time will tell. Over the years I have heard a lot of fairy tale stories about the awesome networking capabilities of QNX. There is this particular one about dragging windows across virtual desktop created out of multiple networked PCs. Unfortunately I’ve never got a chance to see it with my own eyes, so I finally decided to take things in to my own hands. I want to see it! 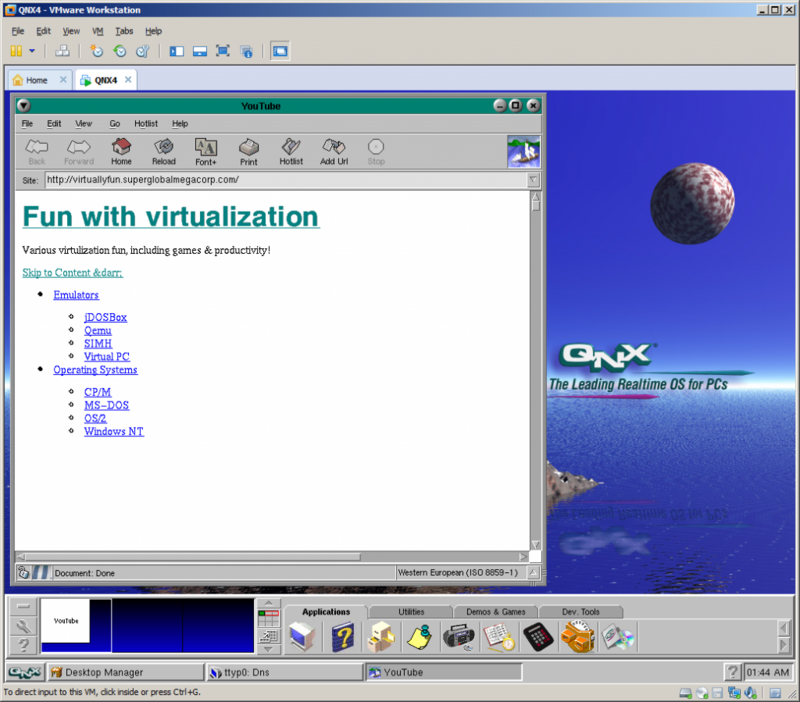 I have created a standard 32bit virtual machine in VMware and booted with QNX4CD.110614.iso. The installation is straight forward, it detects VMware network and graphics cards with no problem. The setup will actually ask you for a QNX Node ID, this will be needed later to create the network. You can simply install few VMs with different Node ID at this point. I wanted to use linked clones so I opted Node ID 1 and changed that later. I’ve enabled to run Photon at boot and went with TCPIP v5. remove node$NODE from the ifconfig en1 line. edit /etc/config/sysinit.1 and remove extra parameters from line with /bin/Net.ether2100 so it only has the & sign. After that I was able to browse web with Voyager. The little OS is pretty fantastic, but as I’m interested in dragging windows, and the OS is covered nicely elsewhere I’m not going to go through all cool features of a single node. Let’s build a network! I have shut down the virtual machine and created two linked clones. Powered them up. The two clones were able to ping each other over the virtual LAN. I’ve grabbed MAC addresses of both nodes and created a file /etc/config/netmap with entries for both nodes where one is marked with ID 1 and one with ID 2. The file should be identical on both nodes. You can use telnet or ftp to copy it across. Use netmap -f to reload the file. edit build/install.2 and change $ /boot/sys/Proc32 -l 1 to -l 2 – this is the Node ID. The configuration steps are documented in more details in this howto. Also going back to the .iso install you can just specify the Node ID during setup. Much easier. Type sin net to display list of nodes and their capabilities. If you issue sin info command you should see Node = 2. If you issue sin -n 1 info you should see Node 1 as the sin command was executed remotely on node 1. You can list remote file systems like this: ls //<nodeid>/ for example: ls //2/. You can execute remote commands using on -n <nodeid> command, for instance on -n 2 who. Impressive, but still not what I wanted to see. Let’s have look have look at a feature called Jump Gate. Sounds like Stargate and actually works pretty similar. Jump Gates, Ditto and other features are documented pretty well here. Note the videos are best viewed in 1080p or “original” quality, full screen. Now this is exactly what I wanted to see! Show me another OS that can do that… Note that not all of the nodes have to be QNX OS. You can extend display by using Phwindows for Microsoft Windows or X11 as well! So for some reason I though I would have luck with this super old m68k port of Linux running on UAE, now that it can run AMIX. Sadly it cannot. From what I can tell the 0.06 strain was the first to boot and do something, so this archive that includes 0.7 along with 0.08 & 0.09 is a good find. While it may not seem that immediately obvious, the m68k port to the Atari ST & Commodore Amiga were the first community port of Linux to a different processor. At the time Linus was working on a Dec Alpha port from what I recall. Author neozeedPosted on January 17, 2013 January 17, 2013 Categories DOSBoxLeave a comment on Sourceforge’s project of the month: DOSBox!